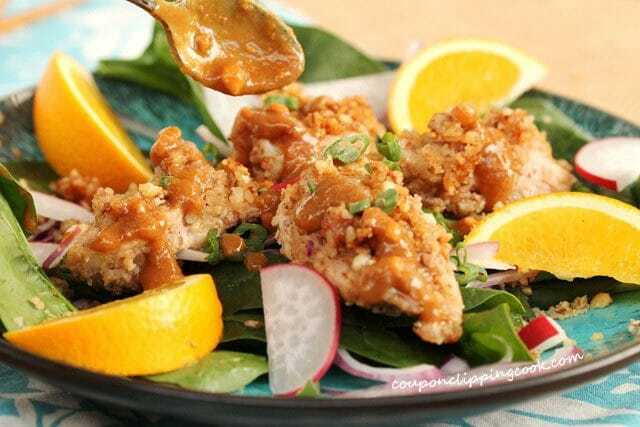 These tender nut-crusted chicken strips topped with homemade peanut sauce have a way of not making it out of the kitchen! 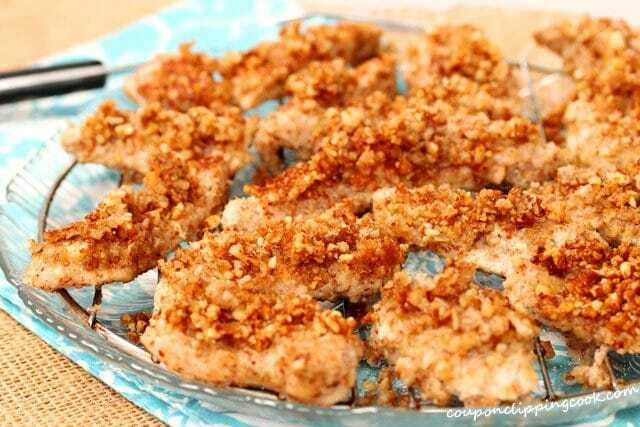 After a little time soaking in coconut milk these chicken strips are coated with ground up pieces of almonds, walnuts and shredded coconut. Then they’re lightly fried and served topped with drizzles of a quick and easy homemade peanut sauce. Frozen boneless skinless chicken breasts are great to have on hand to make easy chicken dishes like this one. Often times when I’m drawing a blank on what to make for dinner, I’ll grab a couple frozen chicken breasts, defrost them, cut them into pieces and make a quick and easy meal using what I have on hand for seasoning like these recipes for example: Easy Barbecue Chicken with Rice, Quick and Easy Tex-Mex Chicken and Rice, and One-Skillet Salsa Verde Chicken with Corn. 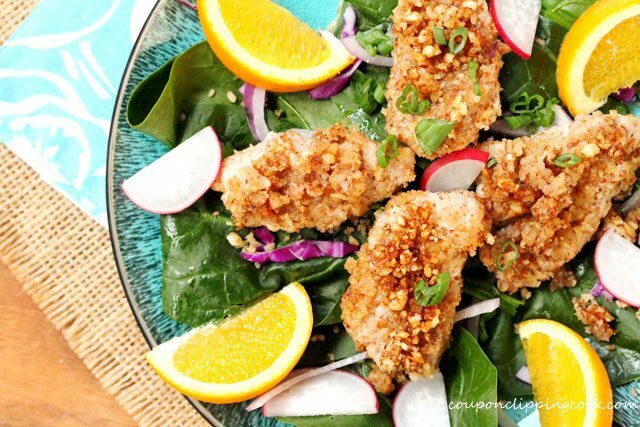 For this nut-crusted coconut chicken recipe, if you’re not a fan of coconut, just substitute buttermilk for the coconut milk, omit the shredded coconut and wella, you’ll have a delicious variation on this chicken recipe for a quick and easy meal. 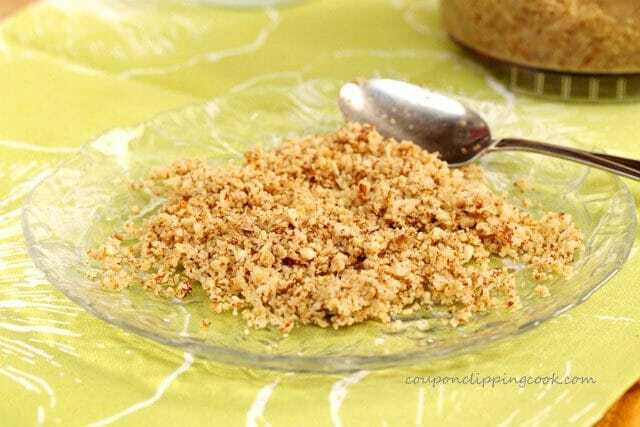 Easy Peanut Sauce – Peanut butter (creamy), Soy sauce, hoisin sauce, rice vinegar, sesame oil, water, ginger root, granulated sugar, and dried red pepper flakes. 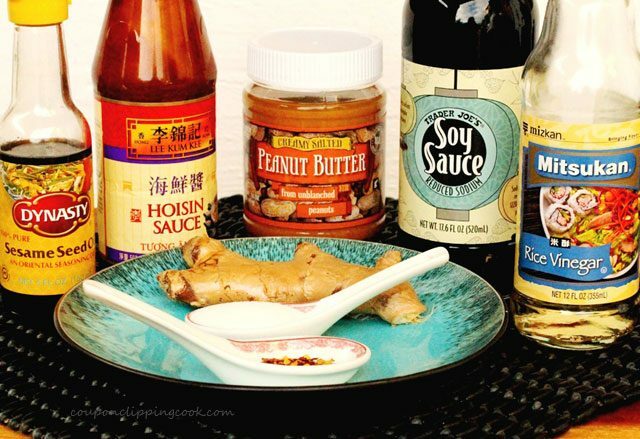 Here’s a link to the recipe for “Easy Peanut Sauce” that’s made with these ingredients. It’s easy to make and tastes so good. 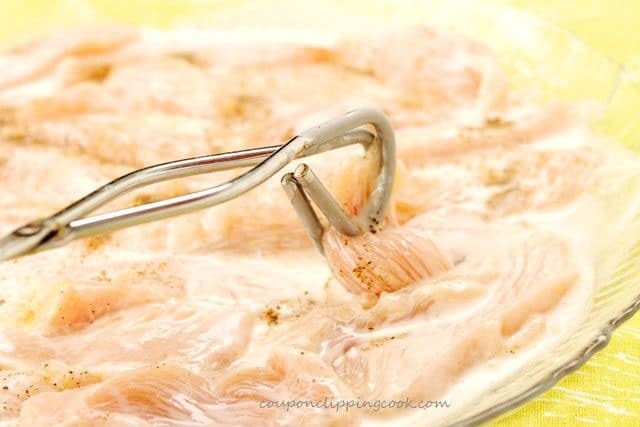 Cut the chicken in strips lengthwise. To a medium size bowl, add coconut milk. Next, add the strips of chicken to the bowl and let marinate for 30 minutes. 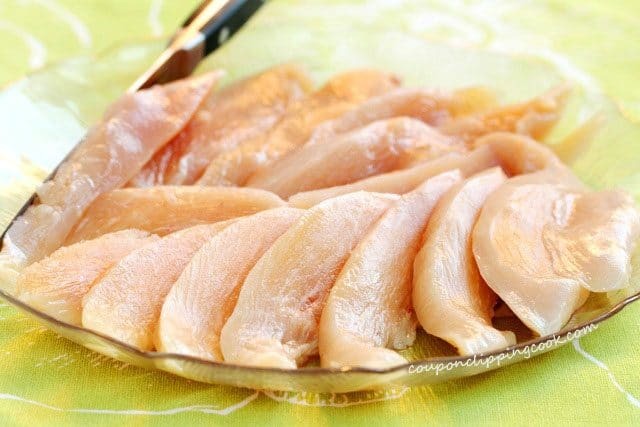 Remove the strips of chicken from the bowl on to a large plate. 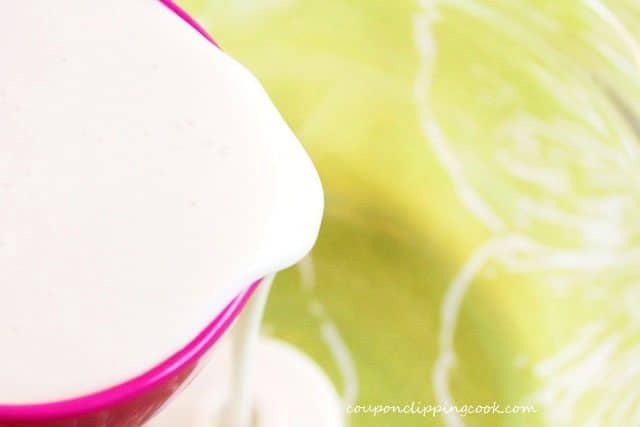 Discard the coconut milk that’s left in the bowl. On both sides of the chicken, sprinkle pepper, granulated garlic and salt. 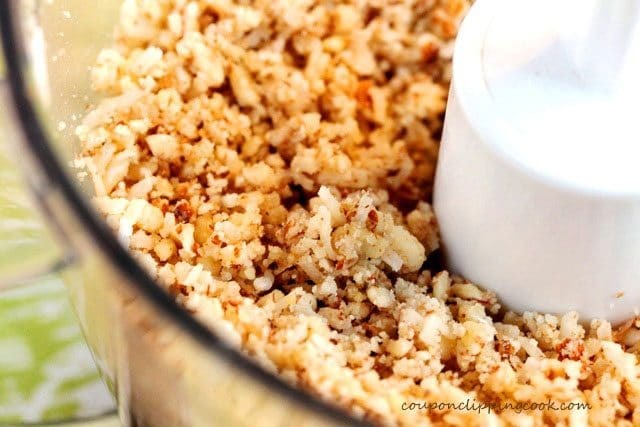 Use the grind setting to chop the nut mixture into the smallest pieces possible. 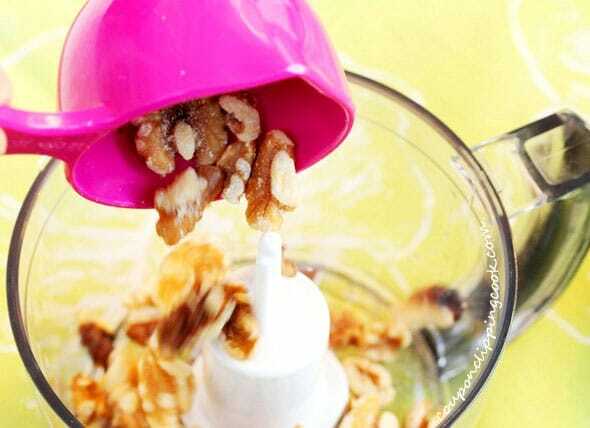 Spread 3 tablespoons of the nut mixture on to a small plate. 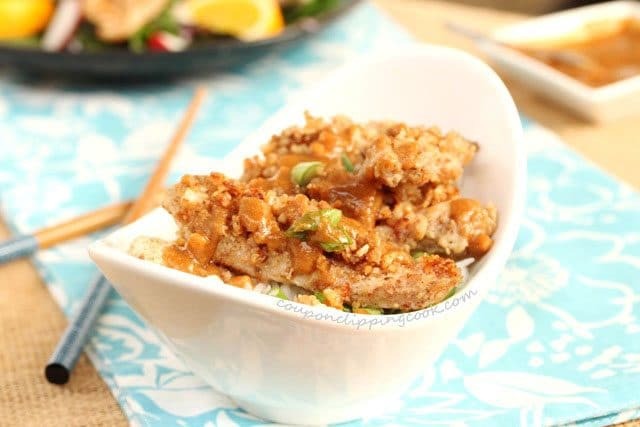 Lay one chicken strip on the nut mixture and gently press down to coat one side of the chicken with the nuts. Then turn over the chicken strip and gently lay it on the nut mixture to coat the other side. Set the coated piece of chicken aside on to a large plate and repeat the coating process on 2 more strips of chicken. 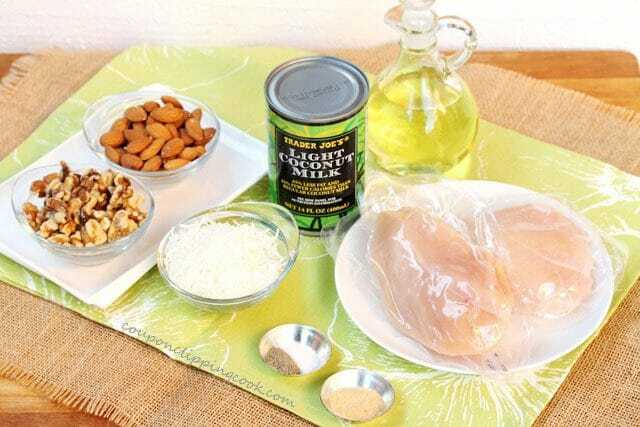 After coating 3 strips of chicken, the nut mixture on the plate may start to get lumpy from the residual coconut milk. 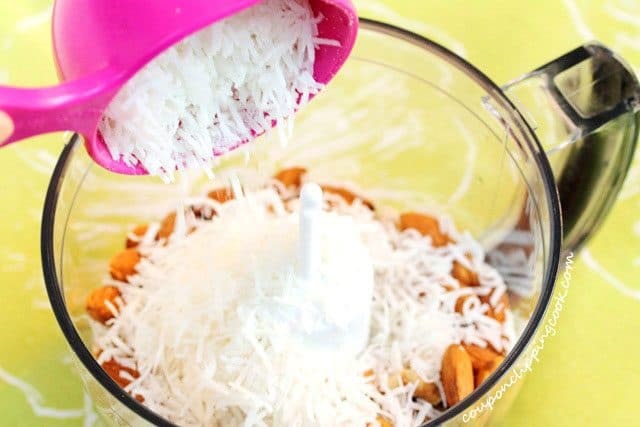 Discard the small amount of nut mixture left on the plate and wipe off any coconut milk from the plate with a paper towel. Next, add 3 more tablespoons of the nut mixture to the plate and repeat the coating process. Continue coating 3 strips of chicken (with 3 tablespoons of the nut mixture) at a time for the remaining chicken. Add a cooling rack on top of a large plate for use after the chicken is cooked. Set aside. Heat a large skillet on medium heat and add canola oil. 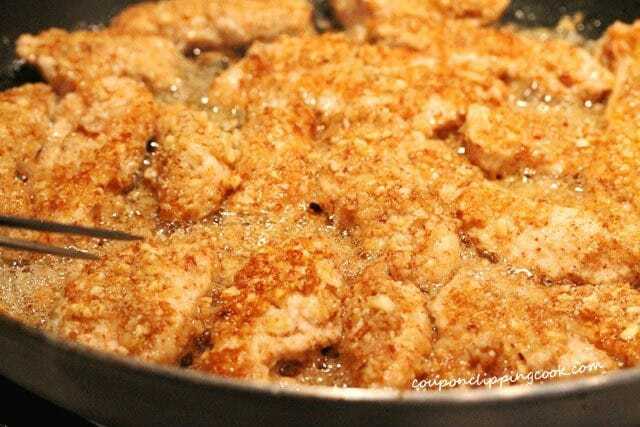 Using a cooking fork, gently transfer each strip of coated chicken from the plate to the pan. TIP – It works best if a cooking fork is used rather than tongs when moving and turning the chicken so that the nut mixture doesn’t rub or fall off of the chicken. Keep a close eye on the chicken as its cooking and as soon as the bottom side starts to turn a golden brown color, gently turn the pieces over. If the chicken is browning too quickly, turn the heat down just a bit. Once both sides of the chicken are a golden brown color and the chicken is thoroughly cooked, gently remove each piece from the skillet on to the cooling rack. Some of the nut coating may come off of the chicken when cooking. 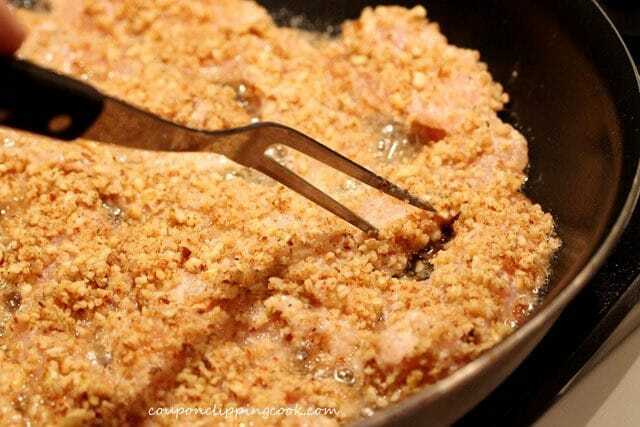 For the residual nut mixture that’s left in the pan, scoop it out with a small spoon (tilt the spoon in the pan after scooping the nuts to drain out the oil) and lay it on top of the strips of chicken. Sprinkle the chicken with 3 dashes of salt (or salt to taste). …over rice. Then enjoy each and every tender bite. Cut the chicken in strips lengthwise. Set aside for a moment. In a medium size bowl, add the coconut milk. 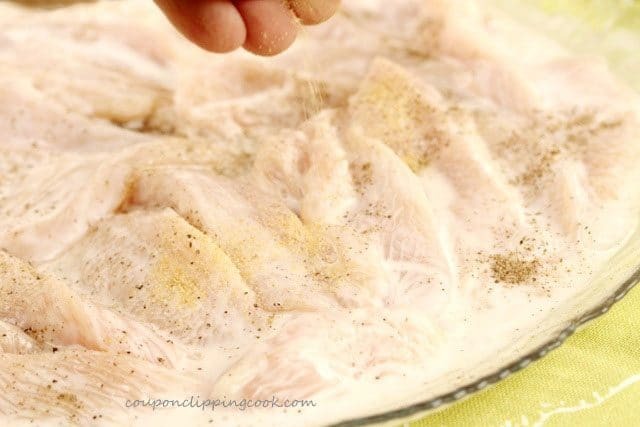 In the bowl, add the strips of chicken and let marinate for 30 minutes. 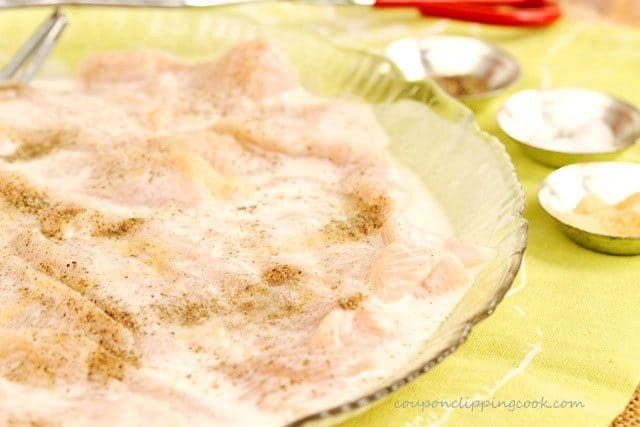 Remove the strips of chicken from the bowl and set on to a large plate. Discard the leftover coconut milk that was in the bowl. Sprinkle pepper, granulated garlic, and salt on each side of the chicken. Set aside for a moment. 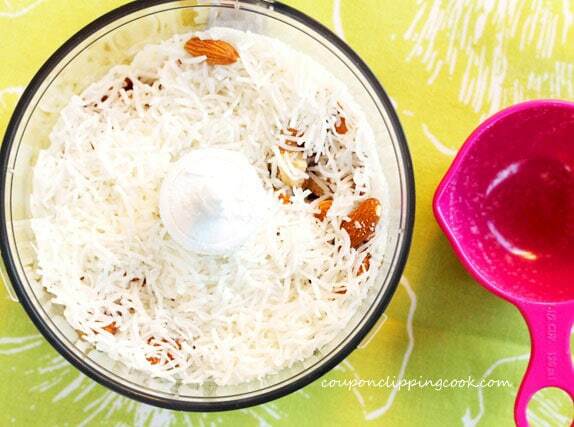 In a food processor, add walnuts, almonds, and shredded coconut. Use the grind setting to chop them into the smallest pieces possible. 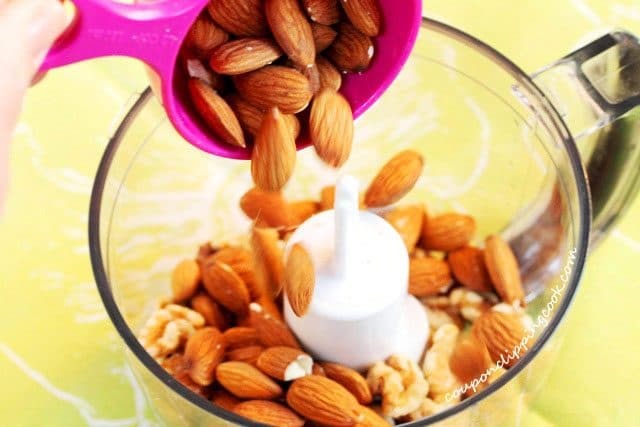 Spread 3 tablespoons of the nut mixture on to a small plate. 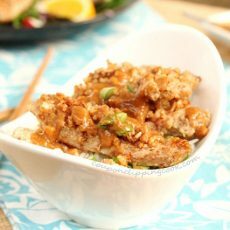 Lay one chicken strip on the nut mixture and gently press down to coat one side of the chicken with the nuts. Then turn over the chicken strip and gently lay it on the nut mixture to coat the other side. Set aside the coated piece of chicken on to a large plate and repeat the coating process for 2 more chicken strips. Then add 3 more tablespoons of the nut mixture to the plate and repeat the coating process. Continue the process with 3 strips of chicken (and 3 tablespoons of the nut mixture) at a time. Heat a large skillet on medium heat and add canola oil. Then using a cooking fork, gently transfer each strip of coated chicken to the pan. It works best if a cooking fork is used rather than tongs when moving and turning the chicken so that the nut mixture doesn’t rub off. Keep a close eye on the chicken as its cooking and as soon as the bottom side starts to turn a golden brown color, gently turn the pieces over. If the chicken is browning too quickly, turn the heat down just a bit. Once both sides of the chicken are brown and the chicken is thoroughly cooked, gently remove them from the skillet on to the cooling rack. Some of the nut coating may come off of the chicken when cooking. For the residual nut mixture that’s left in the pan, scoop it out with a small spoon (tilt the spoon in the pan after scooping out the nuts to drain off the oil) and lay the nuts on top of the strips of chicken. Sprinkle the chicken with 3 dashes of salt (or salt to taste). Just before serving, drizzle peanut sauce over the chicken. Top with chopped green onion. Serve warm on top of a salad or over your favorite rice. 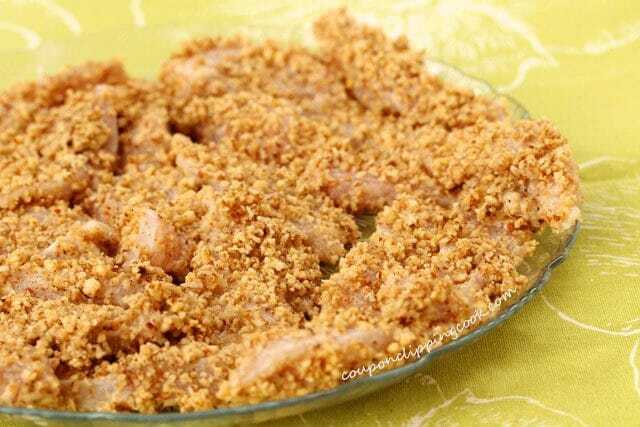 - When transferring the coated chicken strips to and from the pan, and when turning the chicken strips over in the pan, it works best if a cooking fork is used rather than tongs so that the nut mixture doesn’t rub or fall off. 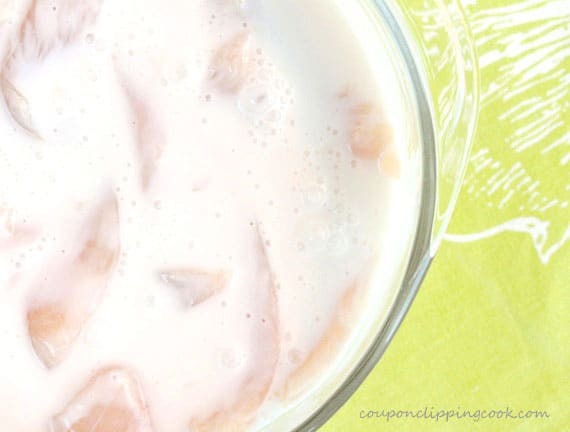 This recipe was originally posted on January 9, 2013. Do you think this would work well baked instead of fried? 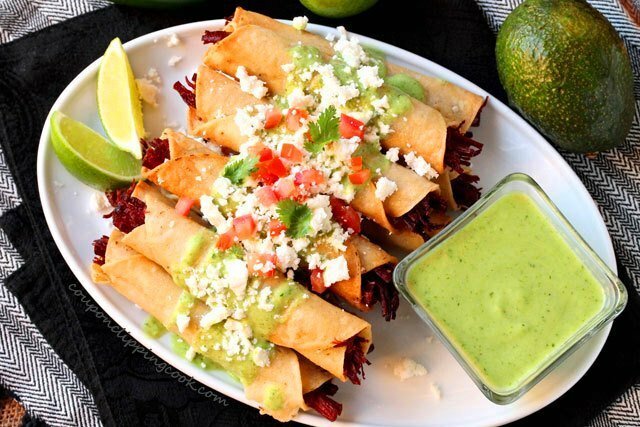 We just don’t do fried anymore, but this looks like an awesome recipe…. Hi Virginia, I tried it baked and it didn’t work well. Seems like it needs a little hot oil to make a crust. 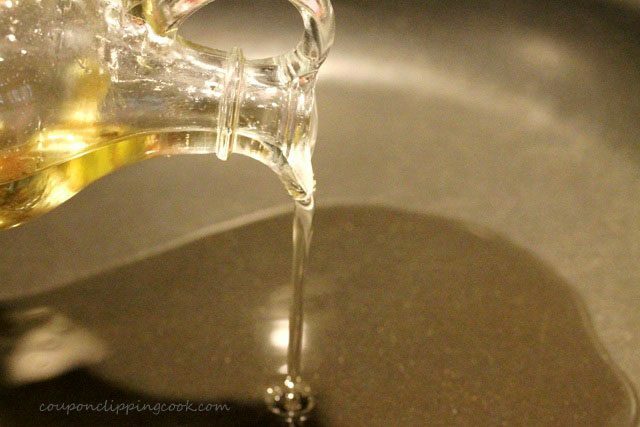 A light saute in just a little olive oil may do the trick. Thank you for stopping by! Being a paleo-eater, I would use coconut oil or butter to fry up the chicken. Just a suggestion – haven’t tried it yet though! Hi Courtnie, both sound delicious with this recipe. Thank you for stopping by!